A UK Space Agency-funded PhD studentship is available at UCL’s Mullard Space Science Laboratory, to work on science preparations for ExoMars PanCam, from 1 October 2015. 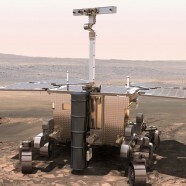 The UCL-led PanCam instrument (Coates et al., 2012, Griffiths et al., 2006) on the ESA-Russia ExoMars rover is due to reach Mars in 2019 following its planned launch in 2018. The PanCam instrument consists of two wide angle cameras (WACs), each of which include an 11-position filter wheel, complemented by a high resolution camera. Images from the WACs at different wavelengths will provide geological and atmospheric context during the mission. Specific to ExoMars is the requirement to identify geological and mineralogical surface deposits that are indicative of ancient habitable conditions and hence inform the selection of the limited number of drill targets. The main objectives of PanCam (Coates et al., 2012) are to: (1) Provide context information for the rover and its environment, including digital elevation models and their proper visualization; (2) Geologically investigate and map the rover sites including drilling locations; 3) Study the properties of the atmosphere and variable phenomena, including water and dust content; (4) Locate the landing site and the rover position with respect to local references, by comparison and data fusion with data from orbiters; (5) Support rover track planning and (6) Image the acquired samples. Development of software and techniques to maximise the scientific value of WAC multispectral data through identification of optimal spectral band combinations and their resulting distribution across the WACs and downstream classification of spectral classes to provide a first level estimation of the geological and/or mineralogical diversity of a site (in collaboration with Dr Claire Cousins, University of Edinburgh/St Andrews). Near sunset on Mars, PanCam will use filters near the 936 nm water absorption feature to determine the atmospheric water content along the line of sight. The student will develop models to invert these data into a height profile (in collaboration with Prof Patrick Irwin, University of Oxford). The student will participate in field trials relevant for the real mission, e.g. future AMASE and SAFER trials, and use tools developed in 1 and 2 above to assist in data interpretation.